The best way to learn to play music. Instantly. 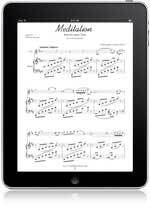 With today's technology, Virtual Sheet Music is committed to giving you the optimal way to learn and enjoy music with your instrument: superior digital sheet music in combination with convenient Mp3 music accompaniment tracks. Accompaniment recordings are not new in music teaching circles. Several publishers and record companies have marketed a program known as "Music Minus One" which combines sheet music with audio CD accompaniments. Unfortunately, such recorded accompaniments are performed by amateur musicians, resulting in uneven dynamics and overly rigid tempos played either too fast or too slow. Also missing from the accompaniments are metronome "clicks", "taps" or other audio markings, always helpful in the practice effort. Music Minus One accompaniment recordings are also often orchestral, which can ill-prepare you for auditions, competitions, or examinations where piano only accompaniment is often the norm. You will need the free Adobe Reader to open and print your PDF sheet music file. iTunes, Windows Media Player or Quicktime will all play your Mp3 accompaniment tracks. Then, upload your Mp3 files to your iPod or other Mp3 player for greater practice opportunities "on the go." 1. The file ending with "_acc" (01Ode_to_Joy_acc.mp3) is the clean, full-speed version of the piece. 2. The file ending with "_accm" (01Ode_to_Joy_accm.mp3) is the full-speed version with audio metronome. 3. The file ending with "_accmsl" (01Ode_to_Joy_accmsl.mp3) is the special slower tempo (-20%) version with metronome recommended for practice purposes. For questions and assistance, please contact us. We always enjoy hearing from you.